Tilthy Rich Compost started in 2012 in Durham, NC when our founder, Chris Russo, moved to the area and saw the need for organics recycling. He initially wanted to convince the city to take on this project themselves but realized the need was too urgent to wait for them to take action. Something had to be done NOW. Enter Tilthy Rich! Chris is also an avid cyclist who believes that if it can be done by bicycle, it should be! That’s where our bicycle-powered model was born and quickly became the cornerstone of who we are as a business. Yep, that’s right. We are a 100% bicycle-powered compost service which means we collect the compostables with our handy dandy bike and trailer units. Cool, right? Our humble beginning started with just Chris and a bike wagon he made from an old futon frame he bought off Craigslist. We’ve now grown to 14 cyclists, 1 full time manager, and two fancy shmancy (professional) bike + trailer units (pictured below). Incredible! 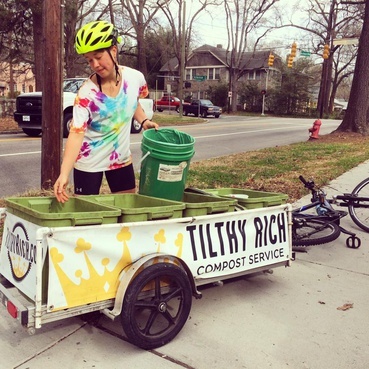 While Tilthy Rich was pedalling around Durham, CompostNow was hustling all around Raleigh and surrounding cities, quickly making a name for themselves throughout the Triangle. 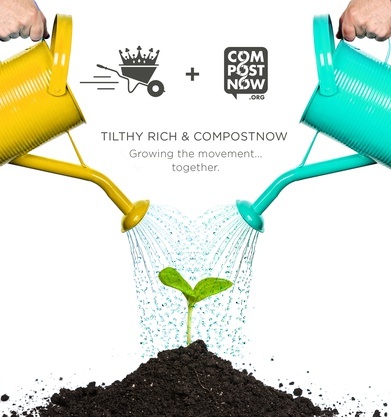 Tilthy Rich and CompostNow have always deeply supported each other. The unending respect was very mutual. So when the option of collaborating/partnering came into play, it was a no brainer to join forces. Fast forward to March 1, 2017 when CompostNow officially acquired Tilthy Rich. Wonderful news in the compost world! So, Kat, what does this mean? I’m glad you asked. This means a whole lot of goodness! We will continue to use our bike-powered model in the downtown area of Durham and are excited to make our routes more efficient (think electric-assist!) using CompostNow’s established systems. We are also exploring the possibility of making other cities we service (Raleigh, Carrboro, etc) bike-powered in the downtowns to reinforce our commitment to clean transportation and deepen our sustainability goals. CompostNow allows us to expand our scope of reach and improve our efficiency while maintaining the integrity of our original mission: making compost easy and accessible for all. I don’t know about you but WE ARE SO EXCITED for what the future holds as we put our heads (and food scraps) together to continue progressing the compost movement in North Carolina and beyond. This is only the beginning. Buckle up, folks. Here we grow! Kat and the Tilthy + CompostNow team!